Feel like you kill every plant that you buy? Don’t worry, you’re not alone! According to the comments on last week’s Indoor Plant Guide, a lot of you feel like a complete brown thumb, brutally murdering every plant that comes through the door. But don’t worry, it’s not you, it’s them! After the experience we’ve had with plants in the studio and the research we did to develop that post, we thought it would be a good idea to put you out of misery by sharing with you how to choose the right plants. Because chances are that rather than being a serial plant killer (now there’s a CSI plot just waiting to happen…. ), you’re just choosing the wrong ones for you and your space. Below we’ve put together 5 questions that cover all the bases when it comes to decking yourself out the right way so they live long, healthy lives. How much sunlight does your space get during the day? This will may also vary from room to room, but before you bring home an indoor plant, take note of how much sunlight comes into your space. If there are areas of your house that receive 4-6 hours or more of sunlight per day, then the space is perfect for the Bird of Paradise, Fiddle Leaf Fig, Rubber Leaf Plant, Jade Plant and Cactus. On the other hand, if you are looking to house your plant in low lit areas such as the bathroom or an office cubicle then the Zanzibar Gen and Golden Pothos (which are notorious for being un-killable) do wonders in these conditions. What is your indoor climate like? Many of the indoor plants that we’ve mentioned in the guide are tropical plants which come from naturally humid habitats. Unless you live in a particularly humid climate, species like the Bird of Paradise, Fiddle Leaf Fig, Rubber Leaf Plant and Split Leaf Philodendron do well with a misting once per day during the summer months and once a week during the winter months. If you are short on time then species that come from drier climates are the way to go. Succulents such as Cactus and String of Pearls as well as the Zanzibar Gem do well with an infrequent yet consistent monthly or bi-monthly watering throughout the year. Do you move houses (or the furniture) a lot? Indoor plants also have an attitude of their own and for some, once they are comfortable they don’t like being moved around (even to a new spot in the house). Not ideal if you love rearranging furniture frequently! The Fiddle Leaf Fig for example, should only be bought or moved during the warmer months as exposure to cold temperatures even for a few minutes can be detrimental to its health. Likewise, the Rubber Plant and Split Leaf Philodendron are sensitive to temperature and light changes so once you’ve found them a nice spot, it’s best to leave them there. Although, it helps to rotate the plant regularly to prevent it from growing lopsided. A big consideration when choosing indoor plants will come down to whether you have pets or even young children. Some indoor plants, as beautiful as they are, are extremely poisonous when ingested so it is best to keep them out of reach cats and dogs or to avoid owning such species. Poisonous plants to watch out for include the Split Leaf Philodendron, Jade Plant, Golden Pothos and String of Pearls. These plants contain a toxic chemical that can irritate the mouth, tongue and lips of animals, causing vomiting, difficulty swallowing and even death in cats and dogs. 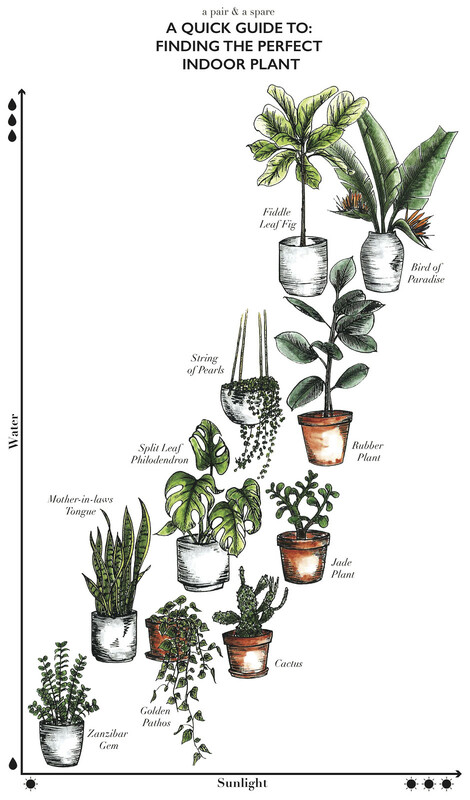 How big is the space you plan to house your plants? Particularly if you own a small apartment or studio, it’s good to know that you won’t be bringing home a Jumangi situation into your house. Plants such as the Fiddle Leaf Fig and Rubber Leaf plant can grow up to 3m tall so are best suited to larger rooms and spaces. While moderately sized plants such as the Zanzibar Gem, Jade Plant and Split Leaf Philodendron can grow to about 1-1.2m high. Another idea in tight spaces is to pick plants that grow up instead of out, the Mother In Law’s Tongue is a great one for this. A good tip if you want lots of leafy coverage but lack the floor space, is to go for hanging plants such as the Golden Pathos or String of Pearls which can grow up to 1m long foliage, which when they get too voluminous, are easy enough to trim back.